Is it just me or did this week drag? Maybe it was the big build up to Wednesday (midterm + ten mile run) but I am wiped! Today was busy and I am currently prepping for midterm 2 (wills and trusts) which is Monday. It never ends! I had a big lunch so for dinner I didn’t want anything big or heavy. I settled for some roasted things. 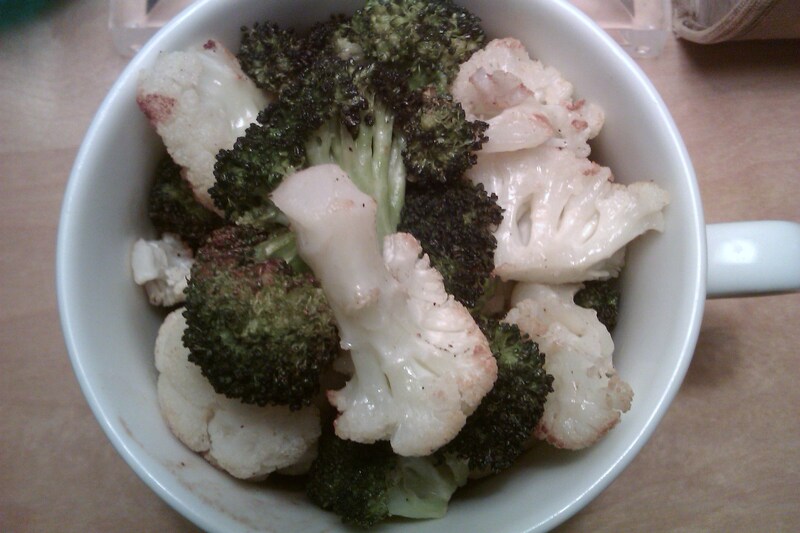 I almost never buy cauliflower but I saw it cheap last weekend at the FM and I jumped on it. There was also roasted potatoes and two pieces of baklava which didn’t get blogged. I stopped at two pieces because I was outlining with “The Biggest Loser” on in the background. Watching Jillian yell at people makes me not want to eat excessive amounts of baklava. Anyone else watching “The Biggest Loser” this season? Tons of exciting stuff coming up tomorrow! I find out if I advance to the next round of Project Food Blog and I’m going to see Tom Petty at the Hollywood Bowl! Plus: more running, and studying! Can’t wait. have fun at the bowl – i can’t believe i haven’t gone all summer!